The next few weeks will be the best time to catch a large swarm. Overwintered colonies are packed with bees, there is no widespread nectar flow, rainy weather is holding the bees in the hive. The feeling of overcrowding is going on now in many hives. Beekeepers are checking their hives weekly for swarm cells. Removing swarm cells before the cells are capped to prevent swarming. Finding a capped queen cell should make a beekeeper pause before the cells are removed. The hive usually swarms when the cell is capped. Not all the bees leave, only the field bees, The house bees can't fly yet. If a capped queen cell is to be removed, make sure a new queen can be obtained. If a queen is not available to purchase, the cell should stay so the queen can emerge to mate and take over as the new queen. By early June there are usually enough drones around and good temperatures for proper mating. Putting out a swarm trap can help catch a swarm, yours or another beekeepers. 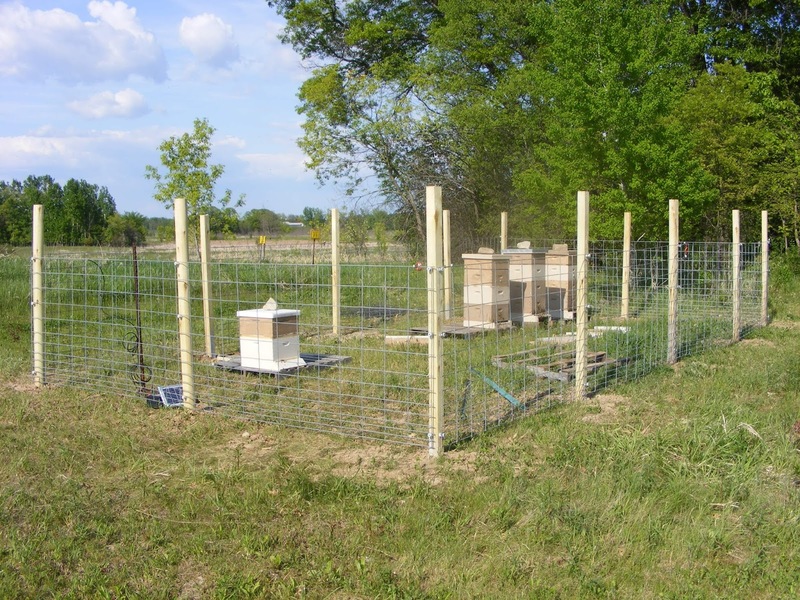 A swarm trap is as simple as one deep box with a few frames in the box. Putting the trap in an elevated position can greatly increase the odds of a swarm moving in. 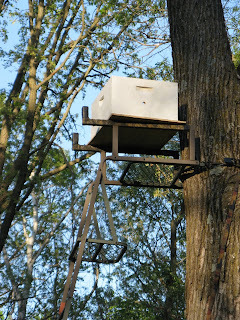 One way to elevate the swarm trap is to use an portable elevated deer stand. A deep is needed for the box size for a swarm to want to move into. 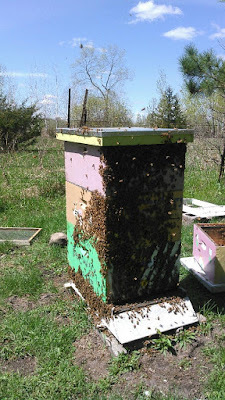 A five frame nuc box is too small for a swarm. This is a video of a beekeeper that put his swarm trap on the top of an old truck. Watch the video and let him tell the story. Black Locust trees are in full bloom across the metro. This can be very good nectar flow if you have some Black Locust trees near your colonies. Strong colonies should have two honey supers on right now. The supers should be checked every five days during this nectar flow. If the hive fills one super and has nectar in the second super, two more supers should be added. Stay ahead of the bees or they will pack the brood nest with honey. Unfortunately, package bees are still to low in population to get a crop of honey from Black Locust. But the package bee populations are getting larger. Everyone that has put in package bees should have their second boxes on by now. Package bees still need to be fed if they are still making comb. With the increasing population of bees, the making of comb will be speeding along at a faster rate. The main nectar flow is on the horizon, it starts around June 15th. While this date is not always exact, it is the date beekeepers use to make sure they are ready. Swarm control is now on the front burner. Getting a good honey crop depends on keeping the bees from swarming. Weekly checks of the hives looking for swarm cells, should be on every beekeepers calendar. Yes, package bees can swarm. Cut the cells before they are capped. This is the exciting time for being in the hive. Frames of capped brood are hatching out bees everyday. Hive strength is increasing. Everyday the number of bees in the hive is greater than the day before. The queen is laying at warp speed. Large populations of bees, with the nectar flow on the horizon. We had a good rain and the warm temperatures are making the bees and honey plants to grow. Beekeepers are hoping for a big honey crop. Totally wiped out the hives. 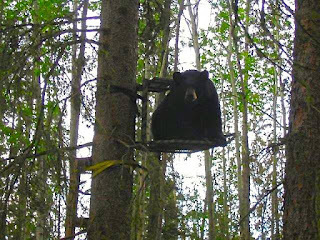 I have been getting many reports from beekeepers getting hit by bears. 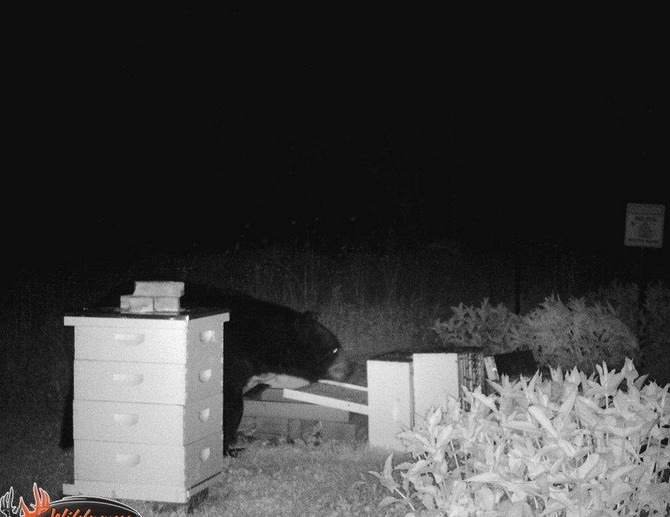 If you live north of 94 you are in bear country. Most of the hits were in the northeast part of the metro. Hugo, Scandia, near Big Marine, Wyoming, Isanti. Better to put a fence up sooner than later. 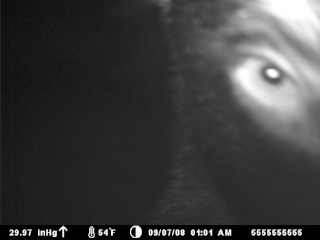 This is a link to the MN Dept of Natural Resources bear fence. The prices are out of date, but the design is sound. This fence used hog panels from Fleet Farm. The panels were insulated from the wood posts and the ground. The panels were electrified. Heavy duty fence. You can weed whip around the fence and will not hurt the fence. I believe this fence area is 16 ft x 32 ft. They do have a full catalog of fencer supplies. In my opinion you can get a better quality of nylon cord fencer wire from them. They do offer different levels quality of fencer cord to pick from. This is a chart of the energizers they carry. To work well on a bear, the energizer needs to put out 2 joules of energy to really get the bears attention. This would be a 110v or a 12 volt fencer. The intellishock31 puts out 3 joules of power for $187.00 a deep cycle marine battery is also needed. Stay away from electric netting. If the grass grows into the netting, the netting can easily get damaged if the netting is to be moved. The fruit bloom is on the wane. I hope all the area fruit growers have not been hit hard from the weekend frost around the metro. The bees have been able to cruise through the cold weather. There may be some chilled brood in some colonies. The cold had probably caused hive clusters to contract some. It wouldn't surprise me to see some dead brood getting hauled out the front door over the next few days. The first delivery of 2 lb packages should have their second boxes on right now. The bees should have drawn out 8 of the 10 frames by now. Don't get hung up on waiting for the bees to draw out the outside frames. If your colony has not finished 8 frames yet, you may have to wait until the bees have achieved this goal. 3 lb packages should also be getting close to needing a second box if one hasn't been added already. When adding the second box, remove one of the frames from the first box that the bees are working on. Make sure there is only honey and pollen on the frame, do not move brood. Place the frame in the second box on the center. This is bait for the bees to move up. Evenly space out the frames in the lower box that now will have 9 frames in the box. It will take the bees about another 3 weeks to a month for the bees to draw out the second box. Change the entrance reducer to the bigger opening. Keep pollen on the hives and continue to feed syrup if there is still comb being built. Now we will be entering a time when there is a dearth of pollen and nectar. This will last for a couple weeks. Pollen patties are on all hives in case pollen is needed in the hive. 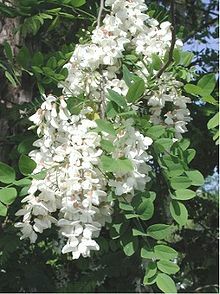 The next nectar flow will be Black Locust trees. Black Locust can produce very nice light honey. The trees bloom in late May, the blooms are large clumps of white showy flowers. While the trees are not in large quantities, the beekeepers that have the good fortune to have them, will benefit. Populations in all hives will be increasing. The warmer weather coming in will help the bees expand their brood nest and occupy more frames in the hives. Swarming will be an ongoing concern in overwintered colonies. I don't think swarming behavior will change until the main nectar flow kicks in around mid June. In the spring when hives swarm. Some beekeepers think they will just let the hive make their own queen. During the month of May in Minnesota, our hives typically don't have widespread drone populations, by early June there usually is good drone population everywhere. Because of low drone populations in May, the odds of a queen getting properly mated are not great. Just because their is a large population of drones in your own hives has no bearing on a queen that you want to get mated. When a queen goes on her mating flight, she will fly further away from the hive than the drones in her own colonies. This prevents interbreeding with her own offspring. So a beekeeper is depending on other beekeepers near them to have a large drone population to mate with their queen. But in the springtime, more than proper mating, it is the time it takes for a queen to lay and the how long it takes for new bees to be able to forage. So let's say the bees swarm when the swarm cell is capped. 6 days to emerging queen. 21 days for the first egg to hatch. 22 days until that first bee can start flying to forage. More than two months from start to finish. This means if a hive swarmed in mid May for example and a beekeepers decides to let them make their own queen and if the queen was mated. It will take to almost mid July before the prodigy from the new queen can start foraging for nectar and pollen. Even if a hive swarmed, but a beekeeper was able to remove all the swarm cells, installing a purchased, and already mated queen, will take around 18 days off this time frame. But before swarm cells are removed make sure a queen is available for purchase. When a hive swarms they do leave behind capped brood and house bees that cannot fly. The capped brood will emerge and the house bees will mature and age. They will forage when they come of age. But the population has suffered greatly from the swarm and a good honey crop is usually not in the cards. So watch your swarming, cut the swarm cells before they are capped. First package bee delivery - adding a box soon? The first delivery of package bees that came here on April 11th. Beekeepers that put the bees on new foundation have been feeding syrup and need to continue to feed the bees syrup until around mid June. If the bees are not fed syrup constantly, the bees won't make wax and the population of bees in the hive will suffer. Keep pollen patties on the hive. The bees should be making wax on the combs and the number of frames with wax should be expanding. It has been three weeks since hiving and there should be or will be soon, new emerging brood. The population of the hive will be increasing from now on. When I inspect a new package on new frames, as I take out the first frame and work towards the inside into the brood area, looking for eggs. When I see eggs, I know everything is good with the queen. I stop looking at this point. As I put the frames back into the hive the same way as they came out, the outside frames have pollen and nectar on these frames. If the bees are working on one side of the frame but not the other, I will turn this frame around when I put it back into the hive. This helps the bees expand the brood nest a little faster. Do this on both sides of the box. Never put new frames into the brood area, this can disrupt the egg laying of the queen. Next week do the same thing with the outer frames. Now if an outer frame has wax on both sides being worked on by the bees, move this frame towards the outside one frame and put a new frame in its place. The reason I do this is because the bees in most cases will never work on the very outside frames. Beekeepers that wait for the outside frames to be finished without moving them in one frame, may have their hives swarm. When the bees have wax on both sides of eight of the 10 frames in the box, it is time to add another box. This usually happens about 30 days after hiving the package. Remove one of the frames from the lower box with honey and pollen on the frame and move this frame to the center of the second, now top box. Place this frame into the center of the top box. The honey and pollen frame is bait for the bees to move up into the second box. Now there is nine frames in the bottom box in the lower box. Evenly space them out in the lower box, there now will be nine frames in the lower box and ten frames in the upper box. 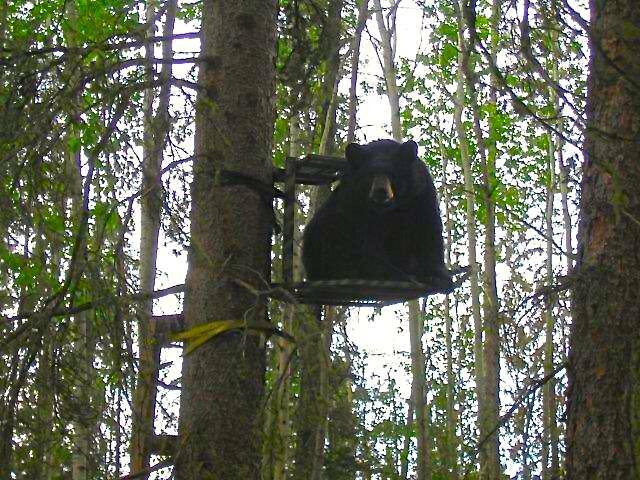 Keep feeding syrup. Now with the emerging brood, the hives population will be picking up steam. With more bees are in the hive, egg laying will increase, and hive development will start moving along faster. It is supposed to be 85 degrees on Friday. If you have a strong overwintered colony that has not been divided, the hot weather will more than likely trigger swarming behavior in these strong hives. Looking for swarm cells every seven days and removing them before they are capped is swarm control. When the bees cap a swarm cell, the hive usually swarms. Going into a colony that has capped swarm cells, a beekeeper will see a large numbers of bees still in the hive. The beekeeper may think that the hive has not swarmed. But the fact is, they did swarm and the queen and foragers have left. There will be no eggs and no young larvae in the hive. Removing the swarm cells and installing a new queen is the best way for a hive to quickly recover. This hive is seriously overcrowded. The beekeeper did a split before the hive swarmed. Photo by one of my customers. Our second delivery of queens are here. I was out helping a beekeeper with a bad shoulder go through his bees. He had one colony overwinter. It was packed with bees. By the time we were able to go through the colony (the photos tell it all) the hive had swarmed. Overcrowded colonies move forward with their swarm plans no matter what the weather. This colony made the swarm cells and took off a day or so ago. There were swarm cells in all three deeps. Must have been thirty swarm cells throughout the hive. If beekeepers don't divide, the bees will divide themselves. Many swarm cells. Proof that swarm cells are not always on the bottom of a frame. Swarm cells on the bottom of frames. Just the swarm cells that we can see on the two pics add up to around 18 swarm cells. We squashed all the swarm cells. If a queen had emerged from a swarm cell, it is very unlikely that the virgin queen (had one emerged), would have been properly mated. We went through every frame making sure all the cells were destroyed. A hive check in a few days to make sure we don't see any eggs (in case we missed seeing the old queen) then put in a new mated queen. The hive is still crowded with bees and there were many frames of capped brood. The hive will recover very well with 6 weeks to the start of the main nectar flow.